The region boasts two festivals of note. The Dok Khoon Siang Khaen Flower Festival is held in April to coincide with Songkran, the traditional Thai New Year. 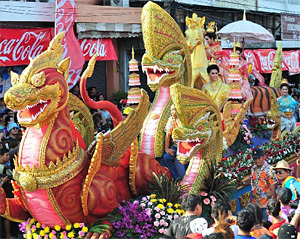 This very colourful occasion is staged in Bung Kaen Nakhan and includes stunning floral parades, Isan folk music, religious rites and merit making along with a lot of singing and dancing. The second major festival is the silk festival, lasting for two weeks from late November into early December, and held in front of the Government Houses. The purpose of this annual event is to promote the quality of the various silks with their distinctive indigenous mudee designs. Nearly every house in the village keeps at least one snake as a pet. In earlier times the residents earned their income from selling herbal medicines but an experimental cobra show in 1951 proved so popular that soon cobra shows became the mainstay of the village's economy. The show is performed at the Wat Si Thamma and includes snake dancing and a boxing match between man and cobra. An educational exhibition celebrating the snake and a nursery are located nearby. Covering an area of nearly 100 square kilometers the park is a mixture of mountains and evergreen lush forest. Wild elephants can be seen at the viewing point at Hin Chang Si, which also offers panoramic views of the Uboltatana Lake and the city of Khon Kaen Another popular viewpoint is Pha Sawan which has particularly impressive views of the pristine verdant jungle. A definite camera opportunity. Located at Ban Wang Khun , the sculptural and mural works alone make this temple worth a visit. Leading up to the ordination hall is a staircase lined with crouching lions. The wall murals, both outside, and inside, reflect the lifestyle of people, the history of Lord Buddha, heaven, hell and local folklore. What makes these special is the brushwork of the murals are usually found in Ayutthaya and around Rattanakosin and not normally found in Isan region. Golf has come a long way in a very short time. As recently as 2007 Khon Kaen had little to offer; just one 18 hole course. Today in the immediate vicinity there are now no less than nine quality courses plus a nine hole course. Depending on how far you want to travel, the neighbouring provinces have more courses. At Ban Nong Kung Soen is a pond covering an area of over 20 rai. Located in an idyllic setting and having the backdrop of Phu Pham Mountain is a popular spot where the locals come to unwind and take it easy. Swimming, boating, fishing and various other water sports are available. In keeping with most large Thai towns, Khon Kaen has many day and night markets selling everything from clothes to household products. The best known is the night market at Ton Tann in the main thoroughfare of Mittrahap Road. The heady mixture of countless stalls all vying for your custom plus live entertainment and inexpensive food all combine to make for a great atmosphere. Despite the large amount of visitors there is always ample parking. The best daytime market is a further kilometer down the road in Nam Muang Road. Again the usual concoction of cheap wares and food is all around with the added bonus of live bands, street entertainers and singers.